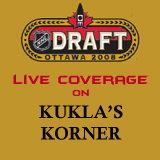 Guest writers Erin Nicks and Patrick Williams are covering the NHL Entry Draft in Ottawa for Kukla’s Korner this weekend. This post will be updated with random news through the evening. Original post-time is 5:26pm. All times EST. Updates will be time-stamped and added below. As the top-ranked North American goaltender in this year’s draft, Thomas McCollum has garnered attention for being a potential franchise backstopper. At yesterday’s media luncheon featuring some of the top prospects, the soft-spoken ‘tender shared a few thoughts on the draft and his future. Blue-chip defenceman Drew Doughty wants to jump immediately into the NHL with both feet—and many think he’s capable of doing so. After a conversation with him yesterday, you get a pretty clear idea of where he’s hoping to land. In preparation for the NHL Entry Draft this weekend, I threw together a short Q&A for both Erin Nicks and Patrick Williams, who are covering the event for Kukla’s Korner.